In the 1920s, barnstormers like Charles Lindbergh and Amelia Earhart relied on fixed-base operations (FBO) to service their aircraft. Others followed suit and FBOs became essential to general aviation. Throughout the decades, most FBOs evolved as family-owned businesses. Over the last 25 years, Signature Flight Support has grown to become the world’s pre-eminent network of FBOs through the acquisition of FBO facilities globally. Today, we provide vital airport services to the general aviation community, such as fueling, maintenance, security, tie-downs, hangars, ramp, staff, and significant capital investments and airport revenues that are the fabric of modern general aviation. Every time I visit a Signature FBO, I make a point of speaking with our recreational pilots. Their sense of adventure and passion for aviation reminds me why I love working in this industry. Most are thrilled with Signature’s services, but I am also sensitive to the concerns regarding fees in the recent article in this publication, ‘Focus on fees’. At Signature, we are committed to ensuring that we support the needs of both the general aviation community and the airports we service, while also running our business in a way that keeps recreational flight both fun and safe. We service more Avgas users than any other company in the world and, by adding more and more self-serve fuel facilities, we are committed to maintaining a secure pipeline of fuel to the next generation of pilots. For the last 25 years, Signature has offered discounted Avgas on the weekends through our Weekend TakeOff program and, through our Signature TailWins program, we offer points for every gallon of Avgas. The idea that pilots could get everything they need by bypassing the FBO does not take into account both the role FBOs play in maintaining the health of general aviation and the inherent costs that come with landing at any airport. Even the barnstormers eventually needed fixed addresses (the first FBOs) to safely operate their aircraft and, in the post-9/11 world, FBOs are even more essential in ensuring the safety of our aviator mavericks. Moreover, the suggestion that FBOs play a non-essential role in general aviation fails to recognize how landlord-tenant agreements work. To be financially sound and reliable, airports enter into relationships with a variety of facility concessionaires and services vendors, such as FBOs, that provide capital investment and generate income streams for the airport to remain viable. These FBOs, in turn, bear the sole cost of bringing the infrastructure, staffing, safety and security, and available services up to the highest industry standards. The industry’s business model is market-based and built to support: 1) The capital investments the company makes in airports and local communities; 2) The company’s commitment to pioneering innovation across the industry; 3) The intrinsic but often invisible services that come with landing at an airport; 4) The airport revenue requirements for its leases and concessions. Local governments have come to view Signature and other FBOs as not just facilities that service local pilots, but also as gateways toward encouraging economic investment in their communities. We are actively engaged in our local communities both in supporting economic development as well as non-profits and local charities. Aviation may look very different than it did when Amelia Earhart was barnstorming across the country, but it is still one of our nation’s greatest pastimes and proudest achievements. At Signature, we are extremely proud to have been able to grow our industry and evolve as it has changed. Maria A. Sastre is president and COO, Signature Flight Support, a BBA Aviation plc company, which is the world’s largest fixed-base operation (FBO) and distribution network for business aviation services. Signature services include fueling, hangar and office rentals, ground handling, maintenance and a wide range of crew and passenger amenities at strategic domestic and international locations. Headquartered in Orlando, Florida, Signature currently operates at more than 200 locations in the United States, Europe, South America, Africa and Asia. 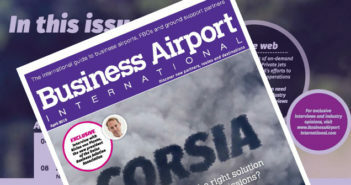 To read Business Airport International’s story on FBO fees, click here.